From the beginnings Clinica Hospital San Fernando in 1949, the Vision was of an enterprise that supplies excellent quality hospital services, with highly qualified personnel in its facilities and equipments that are constantly renew to keep and warranty an up to day concept. There are over more than ten years that these actions are intensify to document the norms, protocols and procedures, first steps to standardization with the purpose to provide a more secure health attention possible for all our customers and users. The goal of obtaining accreditation in security and quality matters was planned, the enterprise chosen to work with this accreditation was JCI (Joint Commission International) finally, after three years of hard work, on August 3, 2011, Clinica Hospital San Fernando became the First Hospital in Panama in obtaining such prestigious Accreditation. Coordinate, impel and develop a work methodology tending to diminish the risks for patients as well as for CHSF personnel. Identify the patients and personnel risk situations. Prioritize the improvements opportunities in relation to the situations presentation during the providing of the health care attention. Give follow up to the improvement plans that are established in the different attention units of CHSF. The Quality Department and Quality Committee have established strategies to integrate the human resource, in a professional work, based on the evidence that gives as result that Clinica Hospital San Fernando becomes the first private hospital in the country, that makes of the patients’ continue quality and security improvement its main priority. 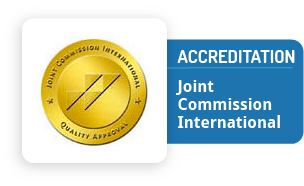 The quality and security culture, once integrated to daily work, will be a warranty for this hospital to maintain its accreditation before the JCI (Joint Commission International). For the security culture establishment the accomplishment of the International Patient Security Goals and Adverse Events Handling security culture is emphasis. The great majority of mistakes worked wide had occurred because the patients were not adequately identified, it obliges the establishment of a procedure that warranties the identification verification of all and each one of the patients before performing an intervention, before administrating a medication or blood components, before performing a surgery or procedure. To assure correct patient identification at CHSF will use two identifications: full name and personal identification cedula, never the location of the room or bed number will be use. In all cases before administering a medication or blood components, perform any kind of treatment or procedure the patient identification will be verity by asking its name and with the data stamped on its bracelet. All patients have the right to a continuous attention within the hospitals, which involves a numerous number of personnel on each patients attention, this makes necessary that the information be expedite, complete, timely and without doubts transmitted, to reduce erroneous interpretations, specially with verbal orders and critic results. It is needed that on each case in which orders, instructions or verbal results are received, the person who receives the information write it down or read it to whom gives it to be sure that the message was understood the same way it was originated. The critic laboratory or radiologic results are immediately communicated to the treating physician. In the hospital concentrated medications and electrolytes are utilized whose usage is very delicate. With this goal what is intended is to reduce the risk of a patient receiving high concentrations of them that could put at risk physical security and the life. High concentrated medications will not be kept at the wards. The CHSF pharmacy keeps strict controls on these medications identification, storage and distribution and follow up their usage in the wards once distributed. World wide numerous events had occurred in which patients have been severely affected, because it was not check that it was the right patient, the indicated procedure, on the correct side. For that reason moreover identifying the patient in two different ways, the surgery site is pointed out in those parts of the body where more than one exists, such as fingers, extremities right and left, vertebrae, etc, the verification of the procedure immediately before beginning the surgical procedure with the objective of reducing at maximum confusing situations that will negatively affect the patient. Surgical site infections, infections associated to urinary catheters, infections associated to central intravenous catheters and associate to ventilators had constitute a challenge for those who work on the health field, because they are the cause of long term stays, complications and patients death. In CHSF a permanent hand washing campaign has been established as first and main measure to reduce infections transmission, it is accomplished with very high security standards on equipments and materials usage on patients care as well as protective measurements applied to either patients, visitors and personnel. The complications of a fall can be either minimum or severe, and the risk of falling is very high in the hospitals, due to the illness itself, treatment, medications administered or by the environment physical conditions, in CHSF all patients are evaluated, from its admission, to identify the risk degree and establish the necessary actions to prevent falls to happen. The best way to face every thing concerning on patient’s security is analyzing situations that can conduct to these adverse events, in a methodical and systematical way. When we talk about adverse event first thing that comes in mind is “Patients Damage”; adverse events are defined as “non intentional damage or lesion caused by the performed aid intervention, not by the base pathology for which the patients was admitted, they can be very obvious because permanent visible damages are produced as is death or member lost or a body function or no importance is given because they are considered as complications related with health care, as is the case of infections acquired in the hospital, local phlebitis associated to catheters and in some cases, are totally unnoticed as is to omit some medications doses or not quantified bleeding occurred sometime during the hospitalization. These more simple events also have to be deeply analyzed because are the ones that on a given time may conduct to a severe adverse event. Is for this reason needed that when a security culture is established the knowledge that these adverse events may occur, their classification and deep and detail analysis of those who falls in great severity category, real or potential. Another aspect that should be considered in security matter attention is the Non intentionality, because if damage intention occurs, it will not be an adverse event and becomes an offense. Adverse events produce minor or great damage to the patient, never the less; it do not have any intentionality degree, which allows better health personnel fear handling that are involved in the adverse event occurrence. Every adverse events handling plan implicit carries the error report, of risk situations and environment conditions that may fall on health intervention results. Non avoidable adverse event, is the non intentional lesion or damage caused by an executed assisted intervention without error, not by the base pathology. For patient’s security, emphasis is made on avoidable adverse events, which are determined by the presence of human error which may be by omission or by action. Action errors are the results of doing what was not suppose to be done and omission error is not doing what was suppose to be done. The most important thing on each reported adverse event is to investigate if damage was cause to the patient followed by type in accordance to its severity. After the adverse event is define, exhaustive analysis is done to identify the factors that conditioned the error occurrence and if the error cause are related to the patient, task and technology, personnel, work team, organization environment and management or institutional context. Once the analysis is completed an action plan is formulated orientated to prevent errors, besides it has to include a patient and family education plan, and very important learned lesion diffusion plan, so the adverse event can become a learning opportunity and continues improvement. Before this initiative and obtained accomplishment, there is no way to go back, once a continuous improvement process and patient security begins it is not possible to undue the processes that makes that each day results be the base that guide towards the quality and security levels that have to be reached in the future, considering that excellence has no limits. Results for each and everyone participating in the process will be obtained as consequence of a quality improvement culture and patient security establishment, a better comprehension of the personal qualification, professional or technique hold, real work team will be conformed, everybody and each one capacity will be improved to evaluate and evaluate, learn to identify risk situations, report weakness, to see each mistake as an opportunity to improve and grow, a better personal, professional and institutional projection will be accomplished, a better status in the community opinion will be obtained and this will be the best retribution to the effort fulfill.